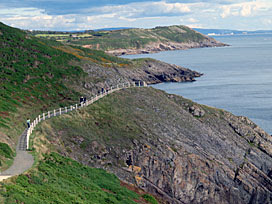 The Wales Coast Path is no mean undertaking, being 870 miles long. I started my assault on the Gower peninsula, which is almost as good as it gets, hiking briefly round the southwest corner to Swansea Bay [map]. It's not everybody's idea of a convenient day trip, three hours on a train from London then half an hour on a bus, but hey, where's your sense of adventure? 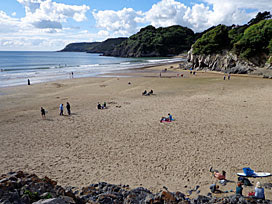 Caswell Bay is often voted one of the best beaches in Britain. Not utterly top notch, you want Oxwich and Rhossli round the peninsula for that, but sandy, sheltered and super for surfing. The number 2C bus rolls in hourly via Mumbles (Sundays excepted), dropping off families, dudes and hikers beneath the cliffs. Three beachside cafes compete for your custom, of which Angela's is the most likely to sell novelty rock and Meg 'n' Ollie's has by far the hippest name. A broad wedge of sand slopes gently down to the sea, ideal even for inexperienced surfers, so long as the tide's not too low for swell. Wetsuited souls tramp out into the waves, board beneath arm or canoe in tow, preparing to ride back in style. Less active visitors sit in groups on the beach or on the rocks and watch. A small stream dribbles out across the sand, so don't bring your best trainers if you go exploring the cliff-face at the western end. Geologists enthuse about Caswell, its rare folds and thrusts and anticlines clearly exposed, although not easily understood. Various seaview apartments perch around the rim of the bay, plus a larger house whose owner keeps a helicopter parked on the lawn. I don't think it's Catherine or Bonnie, but their lairs are hereabouts. The Wales Coast Path rises gradually up the eastern cliff, nothing that'll tire you out too greatly, with increasingly broad views across the sand beneath. Someone's probably already nabbed the bench, but there's room enough to pause along the verge and admire a sweep of jointed rocky strata. Far across the Bristol Channel, if conditions permit, Exmoor and the north Devon coast are plainly seen. Inland the late summer slopes remain bright with flowers in yellow and purple patches across the grass. And that narrow path hugging the contours round Whiteshell Point towards further headlands and bays, that's your journey ahead. The next inlet is Langland Bay, properly the edge of suburbia, with houses and a gothic hotel overlooking the foreshore. A wider range of watersports are practised here, windsurfing included - walk across the beach and you might get to say hi to dad and son wading into the waves. Rotherslade Bay is much smaller and more tightly packed, with shingle and sand accessed via concrete terracing that used to be a dance hall. Another cafe provides an excuse to rest awhile, beneath the beach huts and a stack of (21st century) Art Deco apartments. And then the coastal path rises again for one further glorious mile, the lower path the official route but the parallel upper with a broader vista. It's paved too, ideal for a short constitutional ramble or dogwalk for those who live nearby. Look back to see headlands poking in to the sea, look forward to see a lumpen hillock with lookout station on top and, this being South Wales, a steelworks belching into the sky on the far side of Swansea Bay. Limeslade Bay is the southeastern limit of residential civilisation, and home to Forte's Ice Cream Parlour. This heritage cafe demanded my attention, first for a cup of Welsh Brew Tea (which hit the spot) and then a cone filled with cool homemade yumminess. Refreshed, pass the foot of Mumbles Hill to reach Mumbles Head. Two humped islets rise from the sea, their breast-like appearance perhaps the original inspiration for Mumbles' name. At low tide each is accessible on foot, nearer high tide the distant lighthouse is resolutely inaccessible. And blimey, that pier was well hidden. 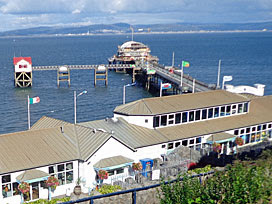 Mumbles Pier is entirely concealed on approach from the west, despite being 250m long with a lifeboat station at the end. It's closed for refurbishment at the moment (closed last year, will reopen next) but the amusement arcade on the foreshore is open as is the cafe. There are so many cafes on this walk (and still more to come in Mumbles proper). We've finally reached Swansea Bay, this the western tip of a ten mile curve with the city at its centre. The world's first passenger railway ran between there and here in 1807, that's before the invention of the steam locomotive. Horse-drawn carriages ran on rails along the foreshore, taking would-be promenaders to the isolated village of Oystermouth in the absence of a road. In its time the railway was also powered by sail, steam, electric, petrol and diesel, before closing for good with the last tram in 1960. One legacy of the 'Mumbles Train' is a broad boardwalk along the edge of the bay, still ideal for strolling. A string of touristy boutiques can be found on the way, as well as what's left of the 'Mumbles Mile', an infamous pub crawl enjoyed by Swansea's drinkers. The Pilot looks the most appealing of the remaining inns and still brews its own beer. If you have time, Oystermouth Castle sits in pride of place above the main road junction, encouraging a visit. And when you're ready to leave, hop on the bus to join the traffic queuing back to Swansea, and then only it's three more hours to London. Next time, really ought to stay longer.